COLLEGE PARK, Md.—The University of Maryland (UMD) has announced the establishment of the Center for Orbital Debris Education and Research (CODER) to address critical issues in orbiting space debris and serve as a hub for academic, industry and government research collaboration. "CODER is the first academically led center established to address the full range of issues surrounding the orbital debris problem," said founding faculty member and Associate Professor of Aerospace Engineering Raymond Sedwick. "Most existing organizations focus on just one aspect of the problem—tracking, modeling, remediation, mitigation, policy, etc.—but CODER will serve as a research collective to provide expertise in all of these areas." Orbital debris is a global issue. The increasing volume of orbiting space debris could significantly hinder future economy and national security as the world's reliance on satellites for communications, research and defense grows. Orbiting debris can travel faster than three times the speed of a bullet and poses a threat to space-based communications, weather forecasting, commerce, scientific exploration, Earth observation and future space activities. The past 50 years of space exploration and use have created an orbiting junkyard of debris. Over 22,000 pieces of space ‘junk’—10 centimeters or larger—are currently being tracked in Earth’s orbit. However, there is a much larger junkyard of smaller debris, with pieces numbering in the hundreds of thousands to millions that are beyond the scope of current tracking capabilities and are just as capable of causing significant damage. Sedwick sees CODER as a nexus for bringing together resources and ideas from across government, industry and academic communities to advance research aimed at addressing the orbital debris issue. There are several existing government, industry and academic organizations in the U.S. that already support critical functions for the orbital debris enterprise, but they are limited by their authority, capacity and budgets. CODER will include a core interdisciplinary team at UMD to conduct and coordinate orbital debris research activities in science and technology as well as policy and economics. The center will spearhead research in each area of orbital debris, including modeling, tracking, mitigation and remediation, assist in developing international policies regarding orbital debris, and serve as a clearinghouse for orbital debris knowledge and findings. 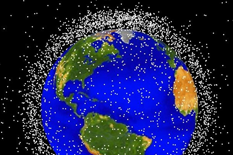 The space community has worked hard to mitigate excessive proliferation of debris by establishing voluntary rules for spacecraft manufacturers and operators that help minimize the creation of new debris. However, there is no system or program in place to remove or clean up near-Earth orbit and there is no program addressing the long-term environmental control of space. So far, debris has been a nuisance and has created minimal damage—the threat has been “acceptable”—because the cost of cleaning it up is so much greater than the satellite damage, thus far. But, in the not-too-distant future, the cost of continuous damage to satellites may approach, and exceed, the cost of cleaning up space. While any cleanup program will take years to implement and possibly decades to carry out, the future and efficacy of orbital operations lies in tackling this critical issue. The Center for Orbital Debris Education and Research (CODER) will address all issues related to orbital debris. These include technology and systems, space policy, economics, legal, and sociological issues. A long-term goal is the development of policies, laws and space systems that will lead to the efficient remediation and control of space environmental pollutants.